It’s a small world full of people and connections, and a vast one filled with choices and materials and art. Where the small and the vast intersect, significant things develop with nuance and panache, as in the home of Susan and Pierre Villere. The two have a heartfelt love for their south Louisiana life, and their Mandeville home reflects the world they’ve experienced traveling together. “I love the Tchefuncte River, but he isn’t invited into my house anymore,” Susan reminisced about the home they once shared on the water. After eight floods over a period of some 20 years, the couple decided they’d had enough and bought land in The Sanctuary. They chose the neighborhood for its central location, but in a small-world element, also because they have known the developers since they were in school together. Shortly after the first meeting with the home’s architect in August of 2005, Hurricane Katrina paused the project. In total, it became a five-year process to build the home, with the Villeres heavily involved from the very beginning. Sitting on three acres, Pierre likes to say the home “is unexpected. The outside looks like a French house, but the inside is a surprise.” Those surprises begin with the custom-made front door with its contemporary leaded glass. Expertly faux-painted to resemble rounded wood, the curved walls envelope and welcome visitors. The sculpture hints at the art collection waiting to be discovered inside. 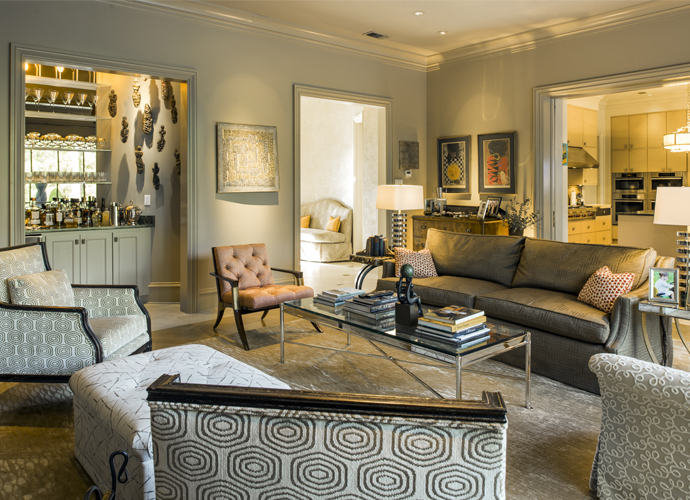 Every aspect, every detail, every element of the home was meticulously planned and executed during the design and construction. After multiple incarnations, the floor plan was finally set at 7,500 square feet, with almost no wasted space. Being serious art collectors, rooms and furniture were arranged to fit the existing pieces in the Villeres’ collection. “We’ve run out of wall space, so we’ve had to move on to sculpture,” says Susan, with no hint of regret in her voice. Pierre also has an elegant collection of antique Italian and Spanish guns, showcasing an entirely different form of artisanship. The library, where backlit shelving wraps the room, was purposefully designed to highlight these pieces. A George Dunbar metalwork piece beautifully complements the space from its custom-size niche on one end of the room. Pierre is an avid hunter and fisherman, and Susan has learned to cook accordingly, whether at this home or at their Grand Isle camp, Covey Rise cabin or New Orleans pied-a-terre. Here, her chef’s kitchen features the ultimate in modern technologies, from a built-in Miele coffee system to a smart refrigerator that keeps varying foods at their ideal temperatures. “I don’t like the wasted space in corners, so we designed the kitchen without them!” she laughs. A steam oven and warming drawers plus a 48” Wolf range are all used regularly. As the couple travels, she collects recipes to bring home and enjoy. 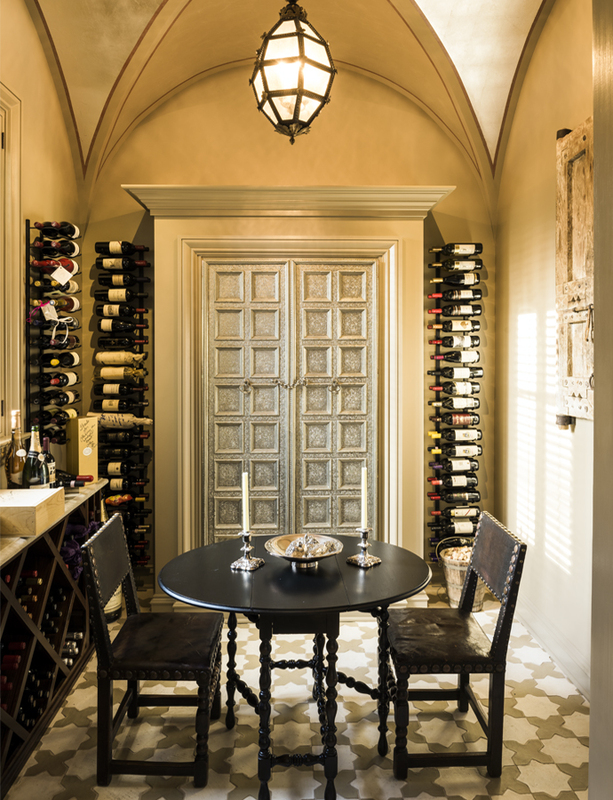 Certain traditions play into their life together, such as enjoying a private Valentine’s Day dinner for two in the wine cellar. 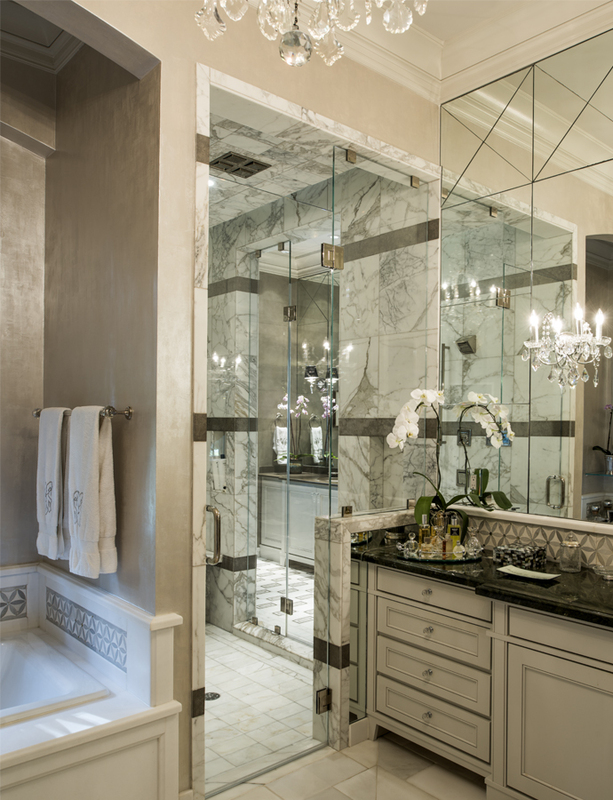 There, the hammered silver doors sparkle in the low light, giving a beautiful ambience to the private space. In the dining room, a room designed for evening use, an entire course can be served to guests from the butler’s pantry that separates the potentially noisy, mussed kitchen. Nothing interrupts the mood of the evening. 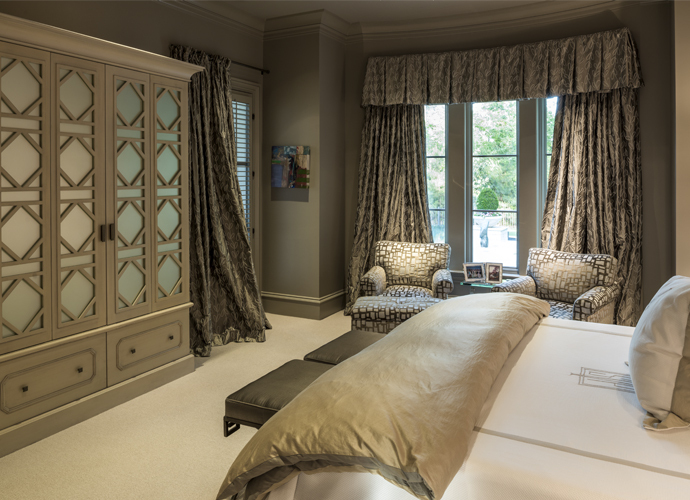 Upstairs, a private guest suite allows long-term visitors to reside in full comfort. Susan enjoys having friends from far away for extended stays, and she knew that including a kitchenette and fully appointed bath suite would make them feel at home during visits. Their two grandsons, ages eight and six, are naturally the most frequent visitors, spending as much time here as their parents could possibly allow. Wandering through the sitting rooms and hallways, you may find another art piece that catches your eye, each piece more varied and distinctive than the last. The exteriors include a mix of both whimsical moving sculptures and authoritative stonework among the formally trimmed garden plantings. The luxurious pool area seems to transport visitors straight from Louisiana to the south of France, with its creamy limestone decking and graciously proportioned swimming pool. A covered bar area with retractable banana-leaf divider walls provides all-season entertaining space for the couple, who enjoy hosting friends and family for everything from sports events to holidays. Gently curved walls also appear on the rear facade, punctuated by columns in the stucco. Sweeping stone railings give a soft, delicate appearance to material that can sometimes seem harsh. Sit and sip a chilled drink and realize that there is no harshness in this masterful mix of far and near, of local and exotic, of worldly and home. Men's Fashion - Southern Classic. Southern Comfort.